In America, the Jetta has held the crown as Volkswagen’s best-selling car for many years, a title that has continued to this day thanks to the success of the sixth-generation model, released in 2011. 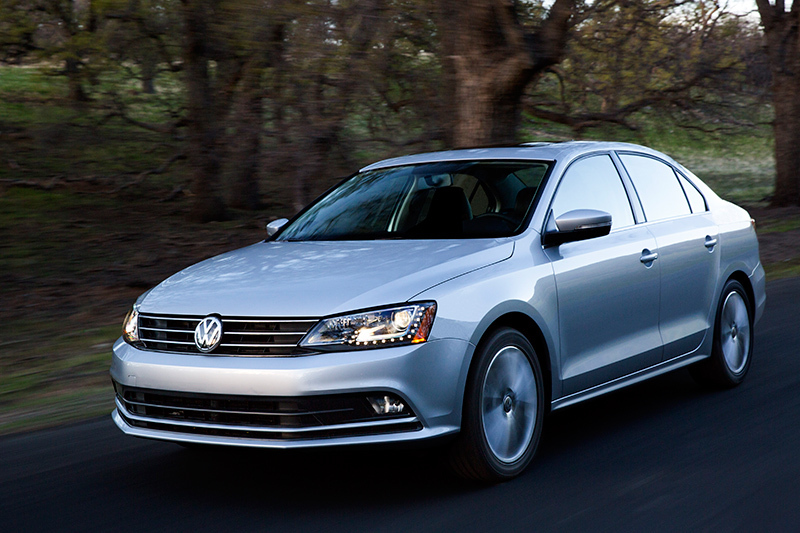 Now for 2015, Volkswagen presents its refined, redesigned Jetta. Following the updates that arrived with the 2014 model, which included a 1.8-liter turbocharged EA888 engine replacing the 2.5-liter five-cylinder unit, the 2015 VW Jetta brings with it a fresh new face and some important updates underneath. The subtly redesigned exterior not only provides the Jetta with a crisp new look, but also helps increase the overall efficiency of the car by improving the aerodynamics. Additionally, the 2015 Jetta features an updated interior, a new diesel engine offering, and a host of newly available driver assistance systems. Under the hood, the latest Jetta continues to offer three four-cylinder gasoline engines (a 2.0-liter naturally aspirated engine, as well as 1.8-liter and 2.0-liter versions of the turbocharged EA888 engine), a 1.4-liter turbocharged hybrid unit, and a new 2.0-liter turbocharged EA288 TDI® Clean Diesel engine. At launch, Volkswagen will also offer the Jetta Sport model. This limited-edition, athletic take on the 1.8T SE trim will offer a sport suspension, front sport seats, RNS® 315 navigation with rearview camera, two-tone 17-inch wheels, foglights, and VW Car-Net® connected car features. When paired with a five-speed manual transmission, the Sport starts at $20,895; $21,995 with a six-speed automatic transmission. Marketing experts call it “class-up appeal.” It’s the offering of more, for less. Which is why, when Volkswagen completely redesigned the Jetta for the 2011 model year, it crafted a bigger car, with a longer wheelbase and 2.9 inches added to the overall length. The increased dimensions allowed designers to incorporate clear, precise lines and muscular surfaces to impart a timeless elegance. Now for 2015, that design is refined even further. At the front, the coupe-like incline of the windshield and the consistent use of horizontal lines define the modern Jetta design. To this, the 2015 model brings a redesigned radiator grille with three cross fins, a new bumper, and available Bi-Xenon headlights with Adaptive Front-lighting System (AFS). These Bi-Xenon units have a distinctive design and unmistakable signature, with each daytime running light being formed by 15 LEDs arranged in an L-shaped string alongside and beneath the xenon modules. This new look is further accentuated by a chrome element between the LED daytime running lights and the xenon lights. The visual band formed by the radiator grille and headlight clusters, as well as the larger lower air intake, give the Jetta a wider and more substantial appearance. This new look is finished off with optional foglights mounted in the outer areas of the bumper. These lighting elements are available as part of a new Lighting Package, which is available on the Sport, 1.8T SE with Connectivity and Navigation, 1.8T SEL and TDI SEL trims for $995. It includes interior ambient lighting, the Bi-Xenon headlights with dynamic cornering and LED daytime running lights, and an upgraded display in the instrument cluster. A top priority for the Jetta’s redesign is aerodynamic improvement, an aspect that directly affects fuel economy. The new bumper and air intakes up front help to reduce air drag, as do updated rain gutters near the A-pillars. Even the underside of the Jetta now features paneling at the rear axle that, along with the sill covers with wheel spoilers and modified brake ventilation channels (1.8T only), help maintain a smooth flow of air along the car. On Jetta 1.8T and 2.0 TDI Clean Diesel models, the radiator grille has a closeable shutter, a feature which assists in improving aerodynamics (by guiding frontal airflow around the body) and fuel efficiency, as well as offering greater thermal control of the engine. By keeping the shutter closed during warm-up, the engine can reach operating temperature faster, after which the shutter is automatically opened and closed as needed. 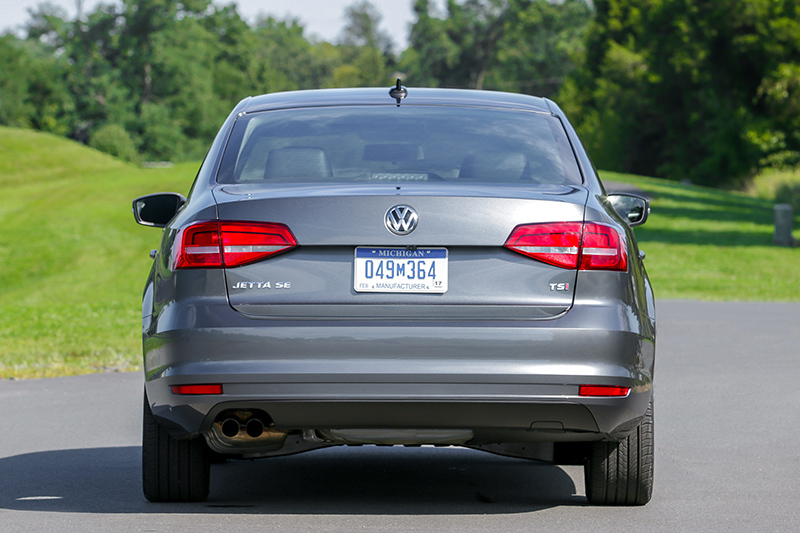 The 2015 Jetta features an updated rear design, including a new trunk lid, taillights, emblems, and bumper. The new trunk lid features an aerodynamic trailing edge—an integrated spoiler that lines up with the car’s silhouette near the character line, extending elegantly into the rear fenders. A redesigned Volkswagen logo sits just below the trunk lid, flanked by available LED taillights (GLI and Hybrid only) with a bright accent stripe. Along with the trunk lid’s prominent side lines and new bumper design, these elements define the new rear look of 2015 Jetta models. The GLI features a more dynamic look than the regular Jetta, courtesy of its large wheels, honeycomb grille, sill extensions, GTI style vertical fog lights, and red-painted brake calipers. At the rear, there are LED taillights and dual exhaust tips. Aside from the blue-highlighted Volkswagen logo and badging, the Jetta Hybrid features a unique air intake, air dam, side skirts, underbody and diffuser that help the Hybrid achieve a lower coefficient of drag than the gasoline- and diesel-powered Jettas. A key benefit of the Jetta’s extended 104.4-inch wheelbase is a truly spacious interior, with impressive rear-seat legroom of 38.1 inches. The gently arcing roofline also means more than ample headroom of 37.1 inches for rear-seat passengers. The Jetta offers a class-leading 15.5 cubic feet of usable trunk space, which can be increased by folding forward the 60/40-split rear seatback. The rear seatback is also offered with a pass-through to help accommodate longer items, like skis. For 2015, updates to the Jetta cabin are subtle but significant. The instrument cluster gauges are now framed in chrome and have a new “tunnel” design. Elsewhere, the new Jetta offers several optional features based on trim: a new multifunction steering wheel; redesigned air vent controls; interior piano black and chrome accents; ambient lighting; and new seating fabrics. Standard equipment and options packages have been updated and reconfigured throughout the model line-up, and now include a selection of new driver assistance systems not available on 2014 Jetta models. Even the entry-level Jetta models come extremely well equipped. The Jetta 2.0L S has standard air conditioning, Bluetooth® connectivity, a multifunction steering wheel, cruise control, one-touch auto up/down power windows, power locks with keyless entry, aux-in for the radio/CD player, and power heated exterior mirrors. Premium features that are offered on Jetta’s various trims include: a six-way power driver’s seat; a leather-wrapped multifunction steering wheel; dual-zone automatic climate control; a sunroof; a soft-touch dashboard; two-tone V-Tex leatherette seating surfaces; RNS® 315 navigation system; Fender® Premium Audio System; Keyless access with push-button start; Volkswagen Car-Net® connected services; and a rearview camera. While the well-equipped GLI is treated to sport seats, unique red piping and other performance-oriented tweaks, the Jetta Hybrid is given its own color instrument cluster (with a “power meter” display) and an assortment of driver assistance systems that are new for 2015, including Blind Spot Monitor with Rear Traffic Alert and Park Distance Control. Fender® Premium Audio System: Developed through collaboration between Fender and Panasonic®, this system cranks 400 watts of power through nine speakers and a trunk-mounted subwoofer to bring the raw emotion of a live music performance to the driving experience. It comes standard with the Jetta 1.8T SEL, TDI SEL, and the GLI SE and GLI SEL; it is optional on Hybrid SEL Premium models. In base Jetta models, a 2.0-liter, naturally aspirated four-cylinder engine is used. This unit features two valves per cylinder and sequential multi-point fuel injection to deliver 115 horsepower at 5,200 rpm and 125 pound-feet of torque at 4,000 rpm. It’s offered with a five-speed manual or a six-speed automatic transmission (S trim only). With the five-speed transmission, fuel economy is EPA estimated at 25 mpg city and 34 mpg highway. Volkswagen pioneered the use of small displacement, highly efficient turbocharged and direct-injection engines in the U.S., starting with the EA113 engine in 2006 Jetta GLI and GTI models. Since then, Volkswagen’s EA888 four-cylinder has helped set the benchmark for small-displacement turbocharged engines, beginning with the 2009 CC. The Jetta 1.8T models feature the third-generation EA888 turbocharged and direct-injection four-cylinder engine that is made in Silao, Mexico. This 1.8-liter engine produces 170 horsepower at 6,200 rpm and a broad torque plateau of 184 lb-ft from 1,500 to 4,750 rpm. The EPA estimated fuel economy rating is 25 mpg city and 37 mpg highway when equipped with either the five-speed manual or the six-speed automatic transmissions. The EA888 Gen 3 engine family is designed to be lighter and more fuel-efficient than the Gen 2 units. Engine weight has been reduced by eight pounds, to 290 pounds overall. Among the improvements on this engine are: a thin-wall crankcase casting; exhaust headers that are integrated into the cylinder head; smaller diameter main bearings; roller bearings for the twin balancer shafts; and a crankshaft that has four counterweights instead of eight. The latest version of the EA888 TSI® engine, in 2.0-liter form, also powers the Jetta GLI models. This double-overhead cam, 16-valve, 2.0-liter turbocharged inline four-cylinder engine produces 210 horsepower and 207 lb-ft of torque. 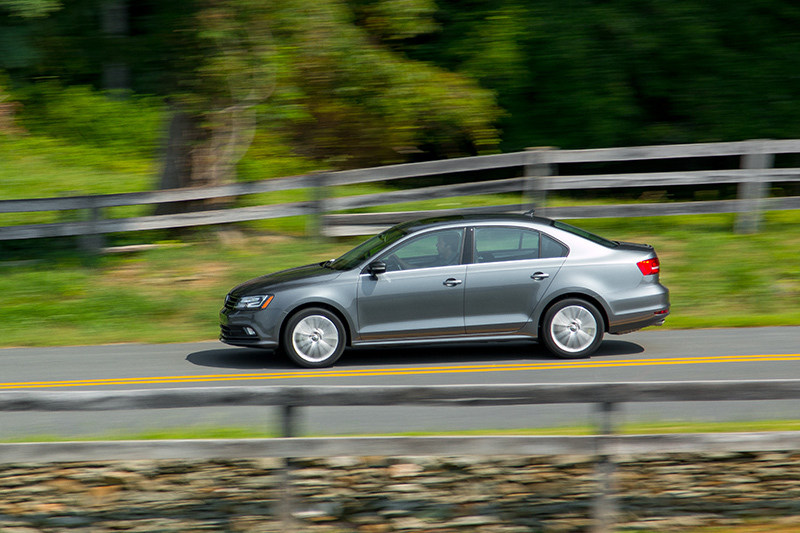 While it gives the GLI exhilarating performance, it is also efficient, with EPA estimated fuel economy of 24 mpg city and 32 mpg on the highway when equipped with Volkswagen’s fast-shifting DSG® dual-clutch automatic transmission. Volkswagen’s all-new diesel engine platform, the EA288, powers the 2015 Jetta TDI Clean Diesel model. It is one of the most fuel-efficient engines in its class, and already conforms to the upcoming LEV3 emissions standard in the U.S. The EA288 engine family is designated the Modular Diesel Matrix, or MDB, which forms the basis for all future U.S.-market Volkswagen four-cylinder diesel products. This new standardized engine platform means that many components of the MDB engines are used in a modular way, such as the exhaust, turbocharging, and injection system components, and forced induction cooling with the intake manifold. The EA288 in the 2015 Jetta is a 2.0-liter, four-cylinder turbocharged and direct-injected diesel engine, and marks a thorough update from the powerplant in the previous Jetta. Despite the similarity in basic specifications, only the cylinder bore spacing carries over from the previous EA189 unit. The new engine produces a peak 150 horsepower—10 more than before—from 3,500 to 4,000 rpm, as well as 236 lb-ft of torque from just 1,750 rpm up to 3,000 rpm. This high torque output is another compelling argument for diesel engines, along with fuel efficiency. The Jetta TDI Clean Diesel with manual transmission delivers EPA estimated fuel economy of 31/46 mpg (city/hwy), an improvement of 4 mpg on the highway over the previous model. The compact EA288 engine has the intercooler for its turbocharger system integrated directly into the intake manifold, which serves a two-fold purpose of increasing throttle response and performance as well as helping lower emissions. The engine block is cast iron, with a forged steel crankshaft that runs in five main bearings and has four counterweights. In order to counteract engine vibration and maintain smooth operation, the EA288’s crankshaft is connected to two gear-driven counter-rotating balance shafts that spin at twice engine speed. Friction has been reduced by about 15 percent throughout, thanks to the use of roller bearings for the drivetrain side camshaft, increased piston-to-wall clearance, and lower piston-ring tension, among other measures. The aluminum-alloy crossflow cylinder head has a number of unique features. First, the camshafts are integrated into a separated housing by a thermal joining process, helping ensure a very rigid camshaft bearing while keeping the weight low. Second, each overhead camshaft operates one intake valve and one exhaust valve per cylinder (as opposed to one camshaft for intake valves only and one for exhaust), allowing for greater air delivery and swirl. Like its gasoline-powered brethren, the EA288 places strong emphasis on thermal management, which is evident in the cylinder head’s two-section coolant jacket, as well as a three-part cooling circuit and switchable coolant pump. Compared to the previous engine, emissions are reduced by up to 40 percent, helped by siting the exhaust after-treatment module close to the engine and by the use of a low-pressure exhaust gas recirculation system. Finally, the 2015 TDI Clean Diesel marks the first Jetta to have a Selective Catalytic Reduction (SCR) catalytic converter and low pressure exhaust gas recirculation system. This layout enables extremely fast response by the oxidation catalytic converter and the SCR catalytic converter, helping to reduce the oxides of nitrogen (NOx) with the use of AdBlue® additive. Compared to the NOx storage catalytic converter (NSC) of the previous model, the use of the SCR catalytic converter helps reduce emissions and improves fuel economy. Like the Jetta GLI, the Jetta TDI sends its power to the wheels through either a standard six-speed manual gearbox or an available DSG dual-clutch automatic transmission. The star of the Jetta Hybrid show is unquestionably a powertrain that’s unique in the compact hybrid segment. Combining a 1.4-liter turbocharged four-cylinder gasoline engine with a 27-horsepower electric motor, the Jetta Hybrid is able to achieve a perfect balance of power and efficiency. The gasoline engine is one of Volkswagen’s latest in the EA211 series of small engines. It features many improvements over the previous EA111 generation, including lightweight aluminum construction, an exhaust manifold integrated into the head, and a toothed-belt drive for its double overhead camshaft valvetrain that incorporates variable intake timing. In fact, the only aspect to be carried over from the EA211 is the 82 mm cylinder spacing. The cylinder bore was decreased by 2 mm (to 74.5 mm) while the stroke was increased to 80 mm, a change which not only helps compactness, but also increases torque and presents an ideal canvas for adding boost (turbocharging or supercharging)—something the engineers at Volkswagen have spent many years developing. The 1.4-liter TSI® engine in the Jetta Hybrid features a 10.5:1 compression ratio, direct injection, and turbocharging to produce 150 horsepower at 5,000 rpm. This engine’s turbocharging system offers incredible boost response thanks to its cleverly designed intake manifold, which enables the use of a surprisingly small, single-scroll compressor. The intercooler is integrated directly into the injection-molded induction pipe. This design generates maximum torque of 184 lb-ft at just 1,600 rpm. An 11.9-gallon tank provides gasoline for the engine and a high-voltage battery placed above the rear axle powers the Jetta Hybrid’s electric motor. This 60-cell system produces a total voltage of 220 V, rated energy of 1.1 kWh, and pulse power of 32 kW. This battery pack is equipped with high-tech cooling and management systems to help ensure efficiency. An industry first, the Jetta Hybrid connects its powerplant to the pavement via a seven-speed, DSG dual-clutch automatic gearbox. This DQ200 is the most efficient DSG transmission offered by Volkswagen, and employs a dry-clutch design as opposed to the wet-clutch arrangement seen in many other Volkswagen products. The unit can be operated as a pure automatic (“D” mode) or shifted manually. There is also a sport setting (“S” mode). Thanks to refined powertrain and features such as a newly designed exhaust system, an acoustic windshield, and thicker front side windows, the Jetta Hybrid is the quietest car Volkswagen has offered in the compact sedan class. Electric Mode: The Jetta Hybrid starts up as an electric vehicle and remains in electric mode up to speeds of 37 mph, dependent on how the driver accelerates and topography. In this mode, the gasoline engine is stopped and is actually entirely disconnected from the drivetrain to help eliminate any loss in efficiency through parasitic drag. 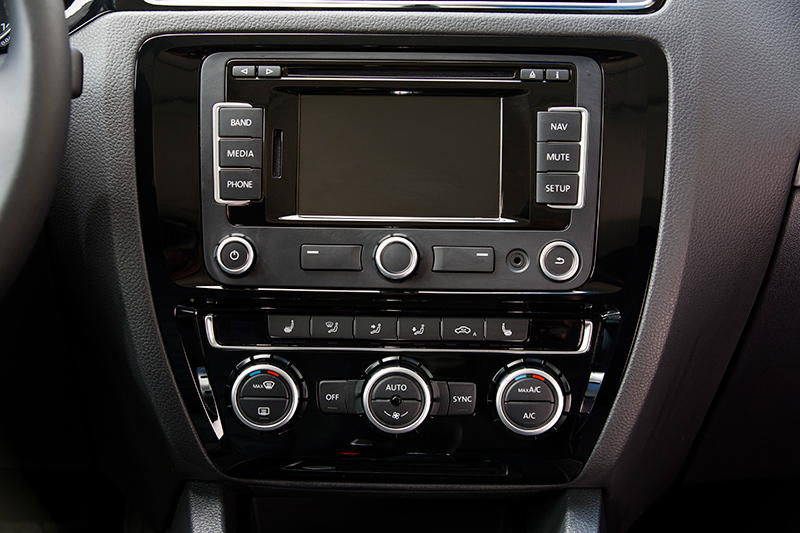 Even though the engine isn’t firing, the HVAC and electrical components, like the audio system, continue to operate. Although not designed for long-range, all-electric driving, the car can remain in this mode for more than a mile given the right circumstances. If the driver selects the “E-Mode” button to the right of the shift lever, the electric mode is maintained up to 44 mph and allows for more aggressive gas pedal inputs without triggering the gas engine. This mode requires adequate battery charge and temperature: if the battery is depleted, the system will reactivate once it has regenerated enough power. Turbo Power: Above 37 mph (44 mph in E-Mode), when the battery level is low, or there’s a demand for additional power, the Jetta Hybrid taps into its turbocharged engine. Once the driver has depressed the gas pedal the required amount, the clutch immediately and seamlessly closes, causing the gasoline engine to start. Once operating, the engine delivers more power than is needed for motion in order to charge the battery pack. Boosting: If maximum acceleration is needed (either through kickdown in “D”, the shift lever in “S” or in the manual gate), the system will begin “Boosting.” In this mode, the electric motor works in conjunction with the gasoline engine, assisting it to achieve the total system output of 170 horsepower. Regeneration and Coasting: While the gasoline engine charges the battery during non-boost states, this requires energy and thus, fuel. The only way of sending charge back to the battery is through regenerative braking. This process occurs whenever the driver applies the brakes, causing the Jetta Hybrid to convert the kinetic energy (in the form of heat) generated by braking into electricity in the battery. The Jetta Hybrid increases the amount of regeneration by decoupling the engine from the drivetrain, helping reduce drag caused by engine braking and increase the amount of retardation needed (and thus heat). Similarly, the engine is shut off and is decoupled from the driveline to eliminate drag caused by the engine’s torque at higher speeds—up to 84 mph—when the driver releases the gas pedal. This helps to save fuel when, for instance, the car is going down a gentle slope or is coasting to a halt. All Jetta models are fitted with a strut-type front suspension with coil springs, telescopic dampers, and an anti-roll bar. They also have a sophisticated multilink independent arrangement that features three transverse and one longitudinal link per wheel. This enables the longitudinal and transverse dynamics to be precisely configured almost independently of each other. The result is more agile, responsive and precise handling. All Jetta models have an anti-roll bar as part of the rear suspension. 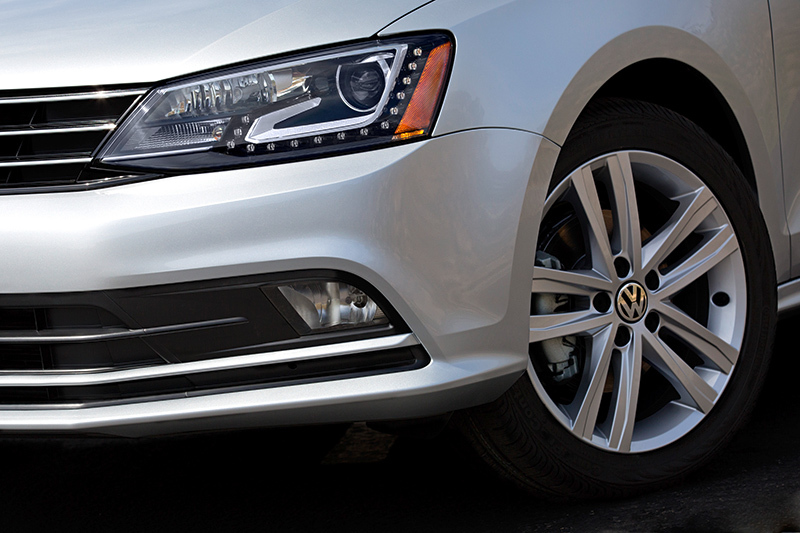 The GLI has a sport suspension that rides 0.6 inches lower than other Jetta models and also features, as standard, the impressive XDS® Cross Differential System. Safety in the 2015 Jetta starts with a stiff and rigid bodyshell constructed using seamless laser welding and high-strength steel in key areas. Also standard on all Jetta models are driver and front passenger front and side thorax airbags and Side Curtain Protection® airbags front and rear. There is also a standard suite of advanced electronic safety features, such as Anti-lock Braking (ABS), Electronic Brake-pressure Distribution (EBD), Electronic Stability Control (ESC), and Hydraulic Brake Assist (HBA). For 2015, a number of new driver assistance systems will be offered on the Jetta, including Blind Spot Monitor plus Rear Traffic Alert and Forward Collision Warning. Also available are the new Bi-Xenon headlights with LED daytime running lights and the Adaptive Front-lighting System (AFS), in which the headlights track the Jetta’s steering angle and can turn up to 15 degrees in response, helping to better illuminate corners in turns. The available new Blind Spot Monitor system utilizes a flashing symbol in the outer area of the side mirrors to help indicate the presence of vehicles in the blind spot next to the Jetta. The system uses radar sensors to help monitor a space around the vehicle with a range of approximately 65 feet. Jetta models that are equipped with Blind Spot Monitor are automatically equipped with the Rear Traffic Alert system as well. This newly available Rear Traffic Alert system not only helps alert the driver to stationary and moving vehicles directly behind the Jetta, but also helps detect vehicles approaching from the side that may be difficult for the driver to see. Like the Blind Spot Monitor, it offers a sizable range of 65 feet, and will present an acoustic warning and apply the brakes if a potential impending collision is detected. Similarly, the Forward Collision Warning system uses radar sensors to help monitor the distance of traffic ahead of the vehicle. Hidden behind the Volkswagen logo on the radiator grille, the radar sensor acquires both the position of stationary cars and motorcycles as well as those moving in the same direction as the Jetta. Within physical system limits, Forward Collision Warning helps warn the driver of critical front-end collision situations, both acoustically and visually by a clear warning symbol in the instrument cluster. These systems are either standard or optional depending on trim. Blind Spot Monitor with Rear Traffic Alert and Forward Collision Warning are available in the Driver Assistance Package, which can be had on SE with Connectivity and Navigation and 1.8T SEL trims, while the TDI SEL trim offers them in the Driver Assistance and Lighting Package, which combines them with the Lighting Package equipment. The GLI SEL offers Blind Spot Monitor as standard, while this system, along with Forward Collision Warning and Park Distance Control, is standard on the Hybrid SEL Premium. The 2015 Jetta models are offered with Volkswagen’s standard five-year/60,000-mile (whichever occurs first) powertrain warranty and three-year/36,000-mile (whichever occurs first) new vehicle limited warranty. In addition, a three-year/36,000-mile (whichever occurs first) roadside assistance program is standard, as is the one-year/12,000-mile (whichever occurs first) Carefree Maintenance® Program that covers the first scheduled maintenance service during this period, at no extra charge. The 2015 Jetta is offered in four trim levels—Base, S, SE, and SEL—with a total of 13 equipment levels. With a starting Manufacturer’s Suggested Retail Price (MSRP) of just $16,215, the base model is available as sold factory order only. A five-speed manual transmission is standard, as are four-wheel disc brakes, 15-inch wheels and a multilink rear suspension. Inside, power windows and six-way manually adjustable cloth seats round out the entry-level Jetta. This trim is not available with an automatic transmission. The 2.0L S starts at $18,425 with a six-speed automatic transmission (starting at $17,325 with a five-speed manual). Key standard features include Bluetooth® connectivity; power windows with one-touch up/down on all four windows; air conditioning; cruise control; RCD 310 radio with CD player; aux-in connection; trip computer; power locks with remote keyless entry; multifunction steering wheel; driver’s seat armrest; and power-adjustable heated exterior mirrors. This trim builds on the S trim and adds a rearview camera, push-button start, and Premium VIII touchscreen radio with SiriusXM® Satellite Radio. MSRP starts at $18,320 with a five-speed manual transmission or $19,420 with a six-speed automatic. Starting at $18,995 with a five-speed manual transmission, the SE adds: the 1.8-liter turbocharged engine; 16-inch “Sedona” aluminum-alloy wheels; heated front seats; electromechanical speed-sensitive power steering; heated washer nozzles; push-button start; Media Device Interface (MDI) with iPhone® adapter; and SiriusXM® Satellite Radio. Adding a six-speed automatic transmission brings the MSRP to $20,095. Starting at $22,325 and only available with a six-speed automatic transmission, the SE with Connectivity builds on the features included on the SE and adds: body-color exterior mirrors with turn signal indicators; chrome front grille and window trim; 16-inch “Arlington” aluminum-alloy wheels; front and rear carpet floormats; V-Tex leatherette seating surfaces; rear seat pass-through and armrest; driver seat lumbar adjustment; leather-wrapped multifunction steering wheel and handbrake; power tilt and slide sunroof; rearview camera; Premium VIII touchscreen radio; and Volkswagen Car-Net® connected car features. Based on the 1.8T SE with Connectivity, this limited-edition model offers both a five-speed manual or six-speed automatic transmission, a sport suspension, and starts at $20,895. Additional equipment includes: two-tone heatable sport seats; heated windshield washer nozzles; RNS 315 navigation; rearview camera; foglights; black headliner;17-inch “Joda Black” aluminum-alloy wheels; contrast stitching on steering wheel, seats, handbrake and shifter; and a rear spoiler. The Lighting Package is optional on this trim. Opening at $23,650, and based on the 1.8T SE with Connectivity, additional equipment includes 17-inch “Joda” aluminum-alloy wheels, Keyless access with push-button start, foglights, and the RNS® 315 touchscreen navigation system. In addition to the Lighting Package, the Driver Assistance Package becomes available, which brings Blind Spot Monitor, Rear Traffic Alert, Forward Collision Warning and an upgraded instrument cluster. Starting at $25,380, the SEL adds two-tone sport seats (with full-power driver seat); Fender® Premium Audio System; a soft-touch dash; Homelink; and automatic dual-zone climate control. The Lighting and Driver Assistance Packages are optional. The 2.0L TDI S is the entry model for the Clean Diesel range, with a starting MSRP of $21,640. It offers the new 2.0-liter TDI Clean Diesel engine; six-speed manual transmission; electromechanical speed-sensitive power steering; remote keyless entry;16-inch steel wheels; chrome grille; heatable front seats; cruise control; Media Device Interface (MDI) with iPhone® adapter; and SiriusXM Satellite Radio. A six-speed DSG® automatic transmission adds $1,100 to the MSRP. With a starting MSRP of $24,075 ($25,175 for the DSG automatic), the SE with Connectivity adds body-color exterior mirrors with turn signal indicators; chrome window trim, and power heated side mirrors. Inside, it offers V-Tex leatherette seating surfaces; driver seat lumbar adjustment; rear seat armrest with pass through; soft-touch dash; leather-wrapped multifunction steering wheels and handbrake; sunroof; VW Car-Net® connected car features; Premium VIII touchscreen radio; rearview camera; and push-button start. With an MSRP starting at $26,410, the SEL builds on the 2.0L TDI SE with Connectivity and adds: six-way power driver seat; Fender® Premium Audio System; Homelink; dual-zone automatic climate control; RNS 315 navigation system; rearview camera; Keyless access and push-button start; foglights; and “Lancaster” 17-inch aluminum-alloy wheels. The Driver Assistance and Lighting Package is available, and includes interior ambient lighting; Forward Collision Warning; Blind Spot Monitor with Rear Traffic Alert; Bi-Xenon headlights with dynamic cornering and LED daytime running lights; and an upgraded display in the instrument cluster. Outfitting the car with a six-speed DSG® automatic transmission will bring the MSRP to $27,510. Starting at $26,920 with the six-speed manual transmission, standard equipment on the well-equipped GLI SE includes: 2.0-liter, 210 horsepower engine; 18-inch “Mallory” aluminum-alloy wheels; sport bumper (front) and side skirts; foglights; automatic headlights; daytime running lights with low beam assist; LED taillights; rain-sensing wipers with heated windshield washer nozzles; rear spoiler; power heated side mirrors; leather-wrapped multifunction sport steering wheel, brake handle, and shift knob; heatable front sport seats with driver’s side lumbar support; Premium VIII touchscreen radio; Fender® Premium Audio System; rearview camera; ambient lighting; Keyless access with push-button start; auto-dimming rearview mirror; power tilt and sliding sunroof; six-way power driver seat; dual-zone automatic climate control; and upgraded instrument cluster. Adding the DSG automatic transmission brings the MSRP to $28,080. The GLI can also be outfitted with available summer tires. Starting at $29,280, this trim adds Bi-Xenon headlights with Adaptive Front-lighting System and LED daytime running lights; foglights with static cornering light; RNS 315 navigation system; Blind Spot Monitor with Rear Traffic Alert; and Homelink. A DSG automatic transmission bumps the MSRP to $30,380. The well-equipped Jetta Hybrid SEL Premium has a starting MSRP of $31,120 and offers a seven-speed DSG transmission. In addition, this trim features: automatic Bi-Xenon headlights with LED DRLs and Adaptive Front-Lighting System (AFS); aerodynamic body kit; rain-sensing wipers with heated windshield washer nozzles; rear spoiler; power heated side mirrors; auto-dimming rearview mirror; Bluetooth connectivity; VW Car-Net connected car features; Keyless access with push-button start; a power tilt and slide sunroof; heatable front seats; rearview camera; RNS 315 touchscreen navigation system with SiriusXM Satellite Radio and Media-Device Interface (MDI) with iPhone® adapter; color display in instrument cluster; a leather-wrapped multifunction steering wheel; Homelink; automatic dual-zone air conditioning; Blind Spot Monitor with Rear Traffic Alert; Park Distance Control (front and rear); foglights with static cornering light; and 17-inch “Buenos Aires” aluminum-alloy wheels. The Fender Premium Audio System is optional. Content and images provided by: Volkswagen of America, Inc.